There is nothing better than getting the chance to spend time with smart, kind people. It’s always a treat. And when Mark and Catherine Graham came to town, you know you will get exactly that. They took the time to teach us a lot. You can read more about the visit here. In addition, they were also gracious enough to let us capture a video conversation between the Grahams and the Hassemans. I felt like it would be a real wasted opportunity if we did not! So though we had a couple of questions prepared for each other, it was a pretty organic conversation. We set up some lights, a couple of cameras (and then made Emily record)…and just went where the conversation took us. We talked about entrepreneurship, marketing, family…and so much more. 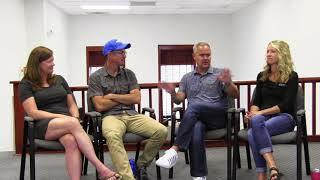 So here is our conversation with Mark and Catherine Graham. As always, we hope this conversation provided value. We aim to do that every day. We know that’s a lot, so if you want to make sure you never miss an update, sign up for our VIP newsletter here.